Skipper Canteen is one of the newer restaurants located in Adventureland in Magic Kingdom. The restaurant is themed to the Jungle Cruise and is the canteen that the Skippers visit to eat. Disney Resort guests can get to Skipper Canteen through a Disney World bus. Those driving will head to Magic Kingdom, park at the Ticket and Transportation Centre and hop on either the bus, monorail or ferry to head over the the Magic Kingdom. Check in is located outside the restaurant under a canopy where there are a few rocking chairs and sofas to sit on whilst you wait for your table. The menu is quite varied and has African/oriental twists on their dishes. They also have an extensive allergy menu that provides a lot of options. The restaurant is split into different sections. We were sat in the main room which is themed amazingly! In the far side, you can even see storage of some decorations from the December overlay of the Jingle Cruise! 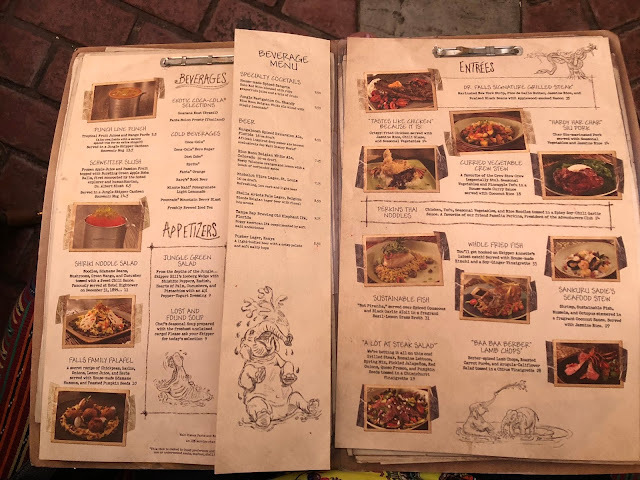 The menu itself is even themed and you can see Trader Sam and the rhino scene signed off by Skipper Will, complete with a coffee ring! The service itself is so similar to the Jungle Cruise with some brilliant puns and that Skipper nature! I ordered the Tastes Like Chicken...Because It Is! It is a (massive) fried chicken breast served with seasonal vegetables, jasmine rice and an amazing chilli glaze. The chicken, as you can see, is huge! It is cooked to perfection and isn't dry. It works so well with the sauce which reminds me a little of a slightly bitter tasting sweet chilli sauce. It works very well with the chicken and the rice. I would recommend this! For dessert I ordered the Quick Sand. This is a jasmine rice pudding served with a lemon curd, meringue and a biscuit-y wafer. The rice pudding is so good! Unlike traditional rice pudding we get here in the UK, it is served cold. But wow, it tasted so good! The slight taste of jasmine with the cream was so nice. The lemon curd cut it very nicely and added a sour taste. The biscuit was really nice and I definitely ate it before I touched the rest of my dessert. Once I finished my food, I had a quick walk around the restaurant. I got a good tickle when I found the barrel of backside of water at the far end of the main dining room. I ended up saying the part from the ride, quite loudly which gave a couple of the Skippers a laugh. By the time we had finished our meal, the restaurant was pretty much empty. We originally had a reservation at 19:00, but had to change it to 20:00 due to a massive storm separating our group. We were able to amend our reservation on the My Disney Experience app quite easily. I just managed to catch the finale of Happily Ever After over the top of the main entrance when we walked out! This was a new restaurant for me this year and I really enjoyed it. The food was a bit different to what you can get in other restaurants and the theming makes it really unique. I enjoy the puns on the Jungle Cruise so really liked how it transferred over to the restaurant and I was giggling pretty much any time our server spoke to us. I would recommend Skipper Canteen, especially if you like the Jungle Cruise! The food is great and added something a little different to our experience. Have you been to the Skipper Canteen?